Baltimore’s latest crime epidemic is illegal genetic enhancements. Convicted dealer Chris Morgan swears off black market genetics for good while serving time behind bars. He’s turned a new leaf and wants a normal life. But before he’s even released from prison, he finds himself on a hit list. Someone wants him dead and he has no idea why. Chris takes the first job he’s offered after his release. But when his new boss is murdered. he fears it has something to do with his past—and so do the police. He enlists the help of a close colleague, Tracy Harrow, to clear his name and search for answers. They discover a shocking connection between Chris and the other names on the hit list. In a perilous race against time, they realize far more is at stake than just Chris’s life. 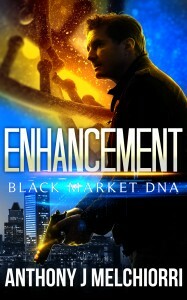 Enhancement is a fast-paced, near-future thriller about genetic engineering, organized crime, and the abuse of advanced technology. Available on Amazon, Kobo, Google Play, Nook, iTunes.